Focusing on the caring side of medicine, while promoting benefits. 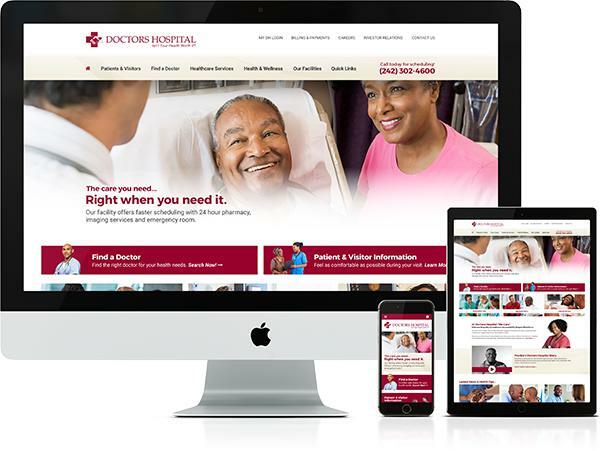 Reviewing the previous website for Doctors Hospital, we gained several key insights. By adjusting the color palette and focusing on warm photography, we helped to promote the caring side of medicine that is actively displayed at Doctors Hospital. A lack of responsive design meant over half of the users were likely to have trouble navigating the site. We devised a responsive layout which optimized the experience, regardless of the users device, while still providing all information. We noticed that the hospital’s primary differentiators, expedited service and 24 hour pharmacy and imaging services, were not being promoted on the site. We adjusted the messaging to highlight these important features.